Lorna Anna Ramona (Holtzen) Harms, was the fourth child born to Alvin M. and Nellie H. (Dunker) Holtzen, on November 12, 1923. She became a child of God through the Sacrament of Holy Baptism in a German service on November 18, 1923, by Reverend H. Schabacker of Friedensau. After being instructed in the Word of God at Trinity Parochial School, she was confirmed on May 29, 1938 by Reverend Theo. Droegemueller, at Trinity Lutheran Church. Her confirmation verse was John 14:6, “I am the way, and the truth, and the life; no man cometh unto the Father, but by me.” She graduated from Deshler High School on May 22, 1942. Upon graduation, she then worked in the Nebraska Security Bank in Deshler. On April 9, 1950, she was united in marriage to her high school classmate, Donald O. Harms, at Trinity Lutheran Church, Friedensau, by Reverend H.R. Miller. Soon thereafter, they became members of St. Peter Lutheran Church, Deshler, NE. Lorna was an active member of St. Peter’s Ladies Auxilary, St. Peter mixed choir and a member of American Legion Auxilary, 43 years in 2018. 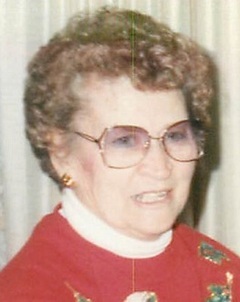 She was a 4-H leader and taught Sunday School. She was a devoted wife, loving mother, grandmother, and great-grandmother. Lorna was an accomplished seamstress. She made many clothes for her daughters and herself, mixing up patterns to fit the person. She had embroidered 12 sets of tea towels and later made each grandchild a pieced quilt, too. Family devotions were daily. Two favorite sayings were: 1. A family that prays together stays together. 2. Train up a child in the way he should go; and when he is old, he will not depart from it. Proverbs 22:6. Having the family over and being together was a blessing. Lorna was preceded in death by her husband, Donald O. Harms of 67+ years on Oct. 4, 2017, her parents, her sons: Harold, Jan. 1, 1999; and Roger, Oct. 23, 1996; and great-grandson Isaiah Nolan Harms. Her siblings: Wilma and husband, Tyndall Anderson; Milton and wife, Lillie Holtzen; Grace and husband, Paul Schardt; Henry and wife, Julene Holtzen; Fern and husband John Hofts; Roy Holtzen; Eldor and wife, Sylvia Holtzen; Wilfred Holtzen; Ethel and husband, Clifford Hulse; and Willard Holtzen. Lorna is survived by daughters: Judy and husband Lloyd Martin, San Angelo, TX; and Susan and husband, Lloyd Wagnitz, Eagle, NE; daughters-in-law, Anita (Harold) Harms, Deshler; Joy (Roger) and husband, Bill Deterding of Cambridge, NE. Grandchildren and great-grandchildren: Jeffrey, Lisa, Ethan & Austin Harms, Bedford, IN; Mark, Kim, Cade & Payton Harms, Taylor & Chase Minihan, Lincolnville, KS; Alison, Tom, Luke, Kate & Dean Otte, Ulysses, NE; Laura Martin, San Angelo, TX; Nolan, Amy, Nevaeh & Johanna Harms, Seward, NE; Abby, Tyson, Noelle & Ellery Warm, Fremont, NE; Jonathan, Laura & Mason Martin, San Angelo, TX; Sara & Cory Rohren, Omaha, NE; Jeremy, Megan, Brantley & Maddox Martin, San Angelo, TX; Tyler, Krista, Reese, Barrett, Maddyn & Brextin Harms, Davenport, NE; Rachel & Chase Burgess, Columbus, NE; and Matthew & Leslie Wagnitz, Garland, TX; sister, Audrey and husband, Joseph Dittmer; sisters-in-law, Luella (Roy) and husband, Delbert Holtzen; and Joan (Willard) Holtzen; many other relatives and friends. Memorials may be made to the church, Deshler Lutheran School, Lincoln Lutheran School or The Lutheran Hour.